We hear so much about personalized learning, but how do we actually achieve this and make that learning visible? Kristin Yann of @Schoolandthecity has figured out how to do just that—in a way that leaves fellow teachers impressed and students begging for more! In this week’s episode, Danielle and Nicole talk to Kristin, a 3rd grade teacher who has drawn upon her background training with gifted students to address the needs of all learners in her elementary ed classroom. What started as a way to augment the social studies and science resources that were lacking in her own school evolved into an entire year long method of assessment that students loved: choice boards. 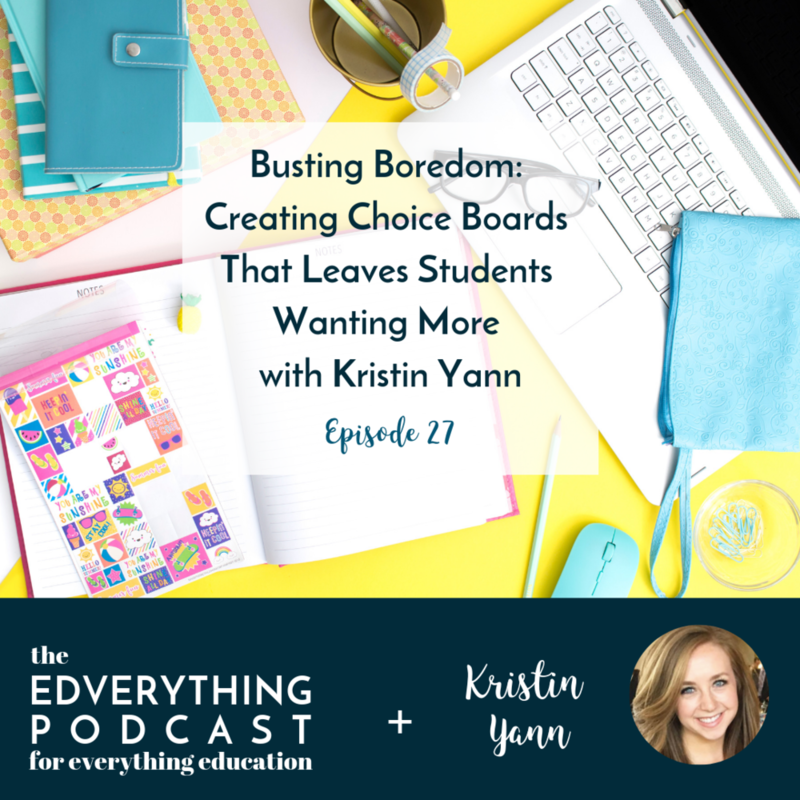 Since successfully developing choice boards for her own students, Kristin has gone on to create choice boards for other teachers and grade levels. Kristin has become an expert on crafting robust, relevant, and student-centered choice boards that engage all learners and allow students to showcase their own unique talents. She explains how this type of project can empower students, giving them flexibility while allowing teachers the chance to challenge students to reach their own potential. Kristin shares tips for helping us make our own choice boards so we, too, can watch our students thrive, eager to display the work that they have created. Kristin has generously put together a checklist to help other teachers design choice boards that work for their own classrooms. Kristin shares her system for putting together effective choice boards, and with this handy checklist, you can start making these tools for your own students immediately. Score yours here.